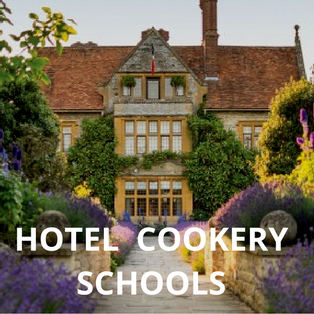 We’ve selected the best places to stay in Sussex, including luxury hotels, boutique hotels, budget hotels, restaurants with rooms and pubs with rooms. With rates provided by our Booking Partners, you can check availability and book. New England style chic and a relaxed seaside vibe await you at The Gallivant. Once a motel, it’s now a restaurant with rooms and a trendy beach retreat for stressed out city types. All of which means you can take a yoga class on the beach, have a relaxing massage in the Beach Hut mini spa or blow the cobwebs away with a yomp along Camber Sands beach (just across the road). Bedrooms are coastal inspired and some are dog friendly. Get cosy in a snug cabin room decked with reclaimed pine and oak. The newly refurbished bar and dining room have a summerhouse feel and open on to a deck. As for the food, the focus is on modern British dishes and sustainability. The charming down of Rye is just a short drive away. Perfect for a potter around the shops or a pint in one of its historic pubs. Located on Rye’s famous cobbled Mermaid Street and with cellars dating back to 1156, The Mermaid Inn is one of England’s most historic pubs. It is also one of the country’s most haunted. On a cold winter’s day, take refuge in the bar, once frequented by the infamous Hawkhurst Gang of smugglers when Rye was a thriving port. Warm up next to the impressive Giant’s fireplace. There are over 52 different gins or 90 whiskies to choose from. The chimney breast has a Priest’s Hole, used in the days when it was a crime to harbour a Roman Catholic. Discover hidden passageways and tunnels. Some of the smugglers, their mistresses and other characters are reported to haunt the inn. Stay in an Elizabethan bedchamber or a bedroom with four poster bed and wood panelled walls. History buffs and ghost hunters will feel at right at home. There’s everything to love about The George hotel in Rye. Dating back to 1575, it has enviable heritage and sits at the heart of this unique medieval town on the south coast. Inside, it’s simply stunning. Old and new sit comfortably side-by-side. There are antiques and cosy nooks but also colourful and oh so tasteful contemporary furnishings, fabrics and lighting. The bedrooms are a joy. All are individually designed and come with luxury touches such as Ren bath products and True Grace room diffusers. The brasserie style restaurant serves up tasty dishes with a Mediterranean influence. Perhaps wood roast lobster with chill, garlic and fennel seeds. A relaxing and informal place to stay, The George in Rye is an ideal choice for a romantic weekend away. Rooms from £110 a night. 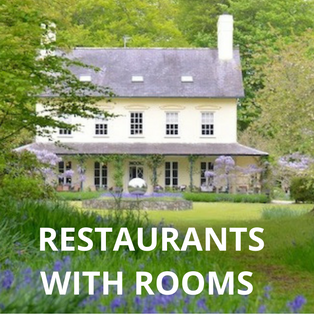 With one of the best restaurants in town, Drakes Hotel is a great place to stay in Brighton for food lovers planning a weekend break away. For the last 9 years, the restaurant has consistently received the highest score for a Brighton restaurant in The Good Food Guide. Once two Georgian townhouses, the boutique hotel stands opposite Brighton’s seafront and its iconic pier and ferris wheel. Many of the sleek and glamorous bedrooms have freestanding baths and sea views. Shop ‘til you drop along Brighton’s famous Lanes and then soak in the tub with a glass of fizz and watch the world go by. Super comfy beds, fluffy pillows, crisp linen, White Company bath products all say romantic weekend getaway, too. Start with a cheeky cocktail in the bar before dining in the elegant restaurant. Perhaps the Sussex wagu beef fillet with foie gras, oxtail ravioli, parsnip purée and Madeira jus? If you remember the first series of Alex Polizzi’s, The Hotel Inspector, this is the original Artist Residence Hotel. Its clever owners now have a handful of artistic boutique boltholes in London, Oxfordshire and Penzance. In Brighton, the Artist Residence is a unique place to stay in this vibrant seaside town. It’s quirky, cosy and stylish. Each of the 23 bedrooms in the period property is individually designed. You get a paired down look with lovely toiletries, Smeg fridges, Le Creuset mugs and Roberts radios. The location is excellent. Both Brighton seafront and the popular Lanes area are just a 5-minute walk away. The Harbour hotel group is known for its smart hotels with spas in traditional British seaside resorts such as Salcombe, Sidmouth and St Ives. The Brighton Harbour Hotel & Spa is a relative newcomer to the group. It’s located in a prime spot on Brighton’s seafront making it a great base to explore all that this lively town has to offer. Bedrooms are smart and contemporary with comfy beds, lovely soft linen, a seating area and spectacular sea views. What makes a Harbour hotel stay so enjoyable are the little touches and the delicious food – there’s complimentary sherry and gin in your room, White Company toiletries, Nespresso machines and fluffy bathrobes. Take time to relax in the subterranean spa: a grotto-like space with hot tubs, sauna, steam room and small pool. It started life as a guesthouse in 1864 and today carries on the tradition. Relaxed, stylish and informal, Kemp Townhouse makes a good base for a weekend break in Brighton. It’s close to Brighton pier and the town’s main attractions and the beach is a 1-minute walk away. The boutique guesthouse is small with just 9 rooms and one public room where they serve breakfast. Expect lovely towels and linen, big comfy beds and stylish, but compact, bathrooms. A nice touch is a carafe of complimentary port in your room. Rooms from £59 a night. If you want to stay away from the centre of hip and happening Brighton but still have quick access to the town, try The Claremont in Hove. It’s a mile-long walk along the seafront or a quick bus ride. This double-fronted Victorian villa is home to a 5-star boutique B&B with 11 spacious bedrooms. Some have four-poster beds. Expect bright and fresh décor, lovely bed linen and heavenly pillows. The owner’s love of art means there are often paintings and sculptures on display by local artists (available for sale). As for eating out, there are interesting restaurants and pubs nearby including The Ginger Pig. Foodies flock to The Ginger Pig pub in Hove for its imaginative British dishes and convivial atmosphere. Local restaurateur, Ben McKellar, is a Brighton food star. He opened his flagship restaurant, The Gingerman, on Norfolk Square, back in 1998. 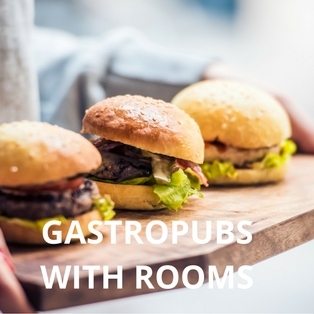 His family-friendly contemporary pub in Hove conveniently has 11 elegantly furnished en-suite double rooms. Minutes from the beach, it’s the perfect tonic for a delicious break by the sea. You get a super-smart bathroom with an over-sized shower or standalone bathtub, a comfy bed with a Hypnos mattress and a coffee machine to help kick start your day. Top-notch food awaits in the smart dining area. Perhaps lemon sole Grenobloise with Puy lentils and roast cauliflower followed by rhubarb and custard pavlova? Breakfast is available for an extra charge. Alternatively, seek out one of Hove’s many excellent cafes and eateries. Rooms from £100 a night. One of just a few Sussex vineyards to offer accommodation among the vines is the Tinwood Estate near Chichester. The vineyard produces high quality English sparkling wine. Wake up to the sound of birdsong in one their luxurious and immaculate lodges. Each one is spacious and stylishly presented with high quality fittings. You get a huge bed, walk in shower, a double bath with jacuzzi and a private terrace overlooking the rows of vines. Dogs are welcome to stay, too. At meal times, walk to the local pub down the road. It serves decent pub food. By car, the catherdral city of Chichester with its shops, restaurants and cafes, is just 10 minutes away. Learn more about English wine by combining your stay with a vineyard tour and wine tasting. Our top tip – if you’re a vintage car enthusiast, Tinwood Estate is one of the best places to stay if you’re heading to the Goodwood Festival of Speed. Lodges from £215 a night.